The truth is: When you are sinking, when you are totally wrapped in your own fear and pain, it is still possible to break out. God’s Loving Presence surrounds you at all times; God shares your pain as only an infinite consciousness can. Hashem feels your hurt, kisses your wound compassionately. The divine steadfast love enfolds you even when the longed-for miracle does not come. Most of us have found ourselves in the position of having no words in response to bad news and suffering of friends and family. Searching for something to say, we may have spoken Scripture only to find our words coming across as empty and hollow comfort. Though most of us want to speak healing too often the words we speak fall like salt on a raw wound and we join the club of Job comforters. Cancer, Alzheimer’s, heart disease… emotional and psychological trauma… loss. Sometimes my heart is overwhelmed with the suffering and sorrows of this world. But how can we encourage or be encouraged ourselves on the journey through pain, suffering, and loss? It was the recent sharing of a friend whose husband was diagnosed with Alzheimer’s disease that sent me on a prayerful journey to find something gentle, simple, and yes practical. 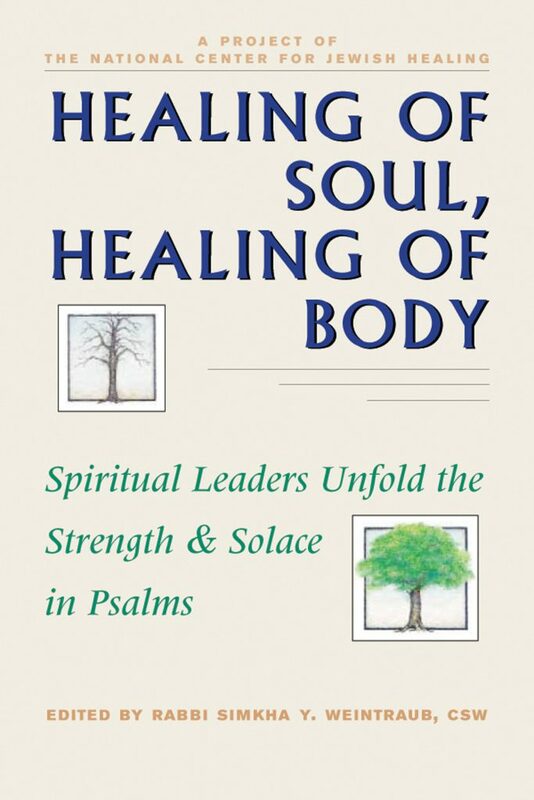 Something that would encourage and even prompt one to understand, receive and join the psalmists in response to the challenges of suffering and pain in our own lives. My search brought me to Healing Of Soul, Healing Of Body. Each of the ten Psalms is accompanied by a reflection from one of ten different contributors with hopes of being a bridge of healing, hope, and praise. Psalm 16 is translated by Rabbi Harlan J. Wechsler; all of the other translations are by Rabbi Simkah Y. Weintraub. All ten Psalms are shared both in Hebrew and English translation. It is universally accepted that one cannot translate great poetry and expect to achieve similar artistic impact in the second language. Poetry is neither linear nor simple, neither two-dimensional nor generic; it is not just words but about relationships which cannot be replicated. Elements such as cadence, rhyme, imagery, structure, and composition simply cannot be “recycled” from one culture to another, or easily transplanted from one century to the next. ** Rabbi Yehoshua ben Levi said: Through ten expressions of praise the Book of Psalms is composed: Nitzuah, Niggun, Maskil, Mizomor, Shir, Ashrei, Tehillah, Teffillah, Hoda’ah, and Halleluyah. I have personally found the Psalms comforting, soothing & releasing when I read & meditate on them. Thank you for sharing Cindy! Jenny I have too ~ and you are so welcome! Keith bought me The Hirsch Tehillim which I’m using as I am spending time in the Psalms – so very good!